There are lots of things you can do in Dubai, you won’t get bored! Although Dubai is famous for it’s glitter and glamour, the skyscrapers and luxury hotels, the emirate has much more to offer. Shop at the biggest mall in the world! It hosts more than 1200 shops and 150 restaurants. There is an indoor ice rink, theme park, massive aquarium and underwater zoo with sharks, stingrays and other fish. Since you’ll be walking long distances, make sure to wear comfortable shoes in this massive mall. With its 828 meter, the Burj Khalifa is the tallest building in the world. An icon which you can see from different places in Dubai, but is the most fascinating when you are standing right in front of it. You have the option to go inside. The observation deck is at the 125th floor from which you will have a stunning view over Dubai. It is smart to book your tickets well in advance here. In between Dubai Mall and the Burj Khalifa lie the Dubai Fountains. From 18:00 onwards every half an hour a fountain show is given to the audience accompanied with lights and music. Visit the Dubai museum to gain an understanding of the history, geography and the population of the United Arab Emirates. It’s incredible to see and understand how Dubai evolved from a desert city to a cosmopolitan city it is today. At the creek, take the abra (wooden watertaxi) to the other side of the creek which takes you to the spice and gold souk. Along the creekside you will find typical wooden dhows with goods to be shipped to India, Iran etc. Not to miss is the historic Al Fahidi District in Bur Dubai with its traditional wind towers. While in the Al Fahidi neighbourhood, pay a visit to the Sheikh Mohammed Centre for Cultural Understanding. They offer many activities, for example traditional meals, heritage tours and visits to the Jumeirah Mosque. An icon not to miss. You can only visit this 7* hotel when you are a hotel guest or have a high tea or dinner booked at one of the restaurants. Another option is to go for sundowners at the Beach Lounge at Jumeirah Beach Hotel. Right next to the Burj al Arab. 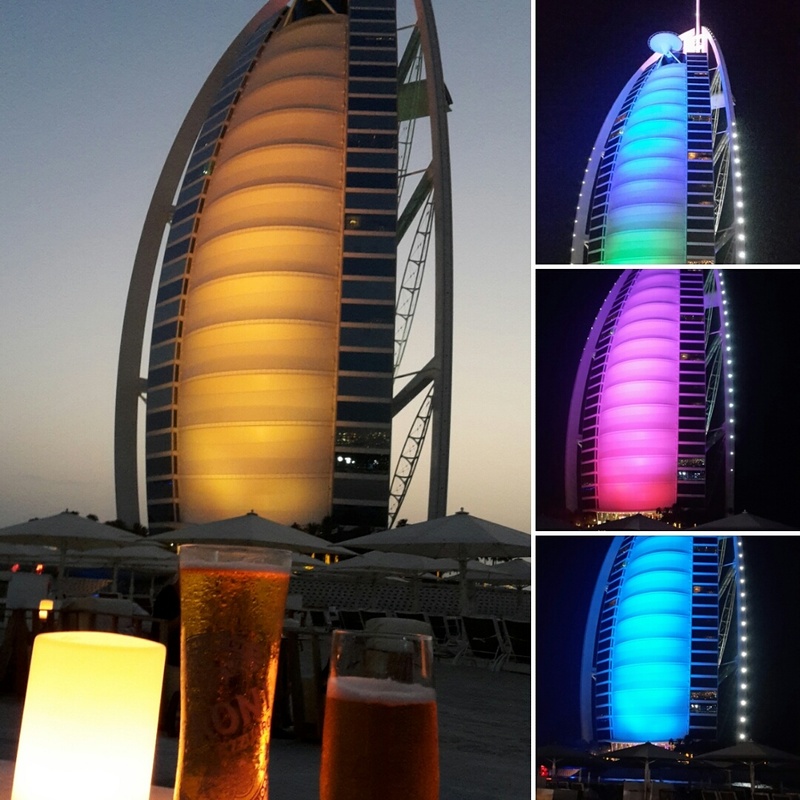 You will enjoy the sunset on the beach with a sundowner in your hand, while watching the sun setting behind the Burj al Arab and watch this icon change its colors during the evening. A man-made island in the shape of a palm tree (made by the Dutch). It is one of the biggest artificial islands in the world. 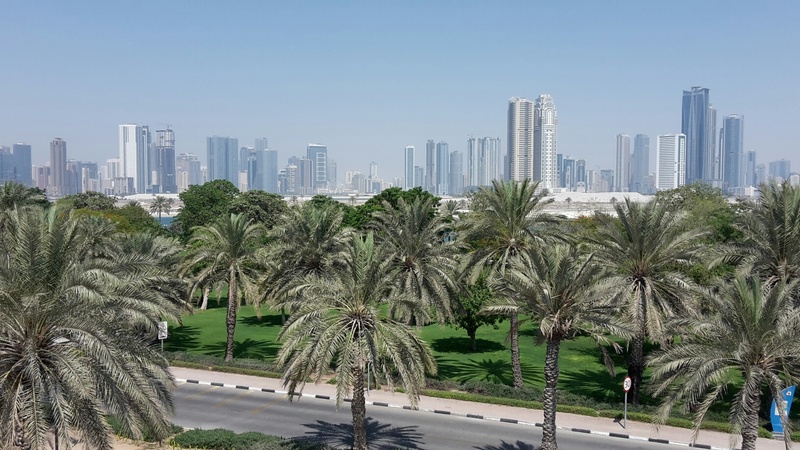 On the palm trees costly villas are situated and on the outer ring famous hotels like Waldorf Astoria, One & Only, Zabeel Al Saraay, Fairmont and the iconic Atlantis. Ask the taxi driver to drop you at the Monorail, which is at the beginning of the Palm. The monorail will take you to the Atlantis Hotel and since it’s above the road, you will have nice views on the shape of the Palm Island. In case you like sun, sea, beach and good food and drinks, this is the place you can’t miss out! The ‘walk’ is almost two kilometres long and stretches along the beach. Especially during the night it’s a popular spot to wander around the beach and have a bite at one of the great restaurants. There is also an open air cinema and small waterpark for children. Just a five minute walk from Jumeirah Beach Residence (JBR) you will find the Marina. Especially during the night it’s an eccentric place to visit and watch the lightened sky scrapers and dhows. Along the Marina Walk there are many restaurants located, as well as the Marina Mall and of course the marina itself. Can you imagine, Dubai hosts a huge indoor ski and snowboard facility! Moreover, you can cuddle with penguins and enjoy an apres ski afterwards. A shopping and entertainment area completely in traditional Arabic style and on a smaller scale and more cosy than the bigger shopping malls. Nevertheless, you can choose from over 40 restaurants and bars. From here you will have a stunning view on the Burj al Arab, especially during the night. I would recommend you visit Souk Madinat during the night, since it’s most idyllic for its ‘Arabian 1001 nights’ sphere. If you are a sports or outdoor fan, the United Arab Emirates has a lot of activities and exciting trips to offer! For desert / outdoor trips, please take a look at the website of the experienced Arabian Adventures. If you are a fan of the water and into kitesurfing and Stand Up Paddle Boarding, DuKite at Jumeirah Beach is the place to be. For the kids the waterparks Wild Wadi Waterpark and Aquaventure Waterpark are guaranteed for lots of fun! Hoi Cynthia, dat ziet er allemaal super uit!